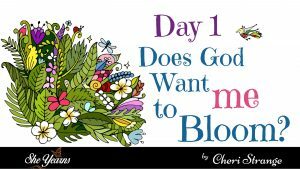 Day 1 – Does God Want Me to Bloom? My house is entered by a long driveway lined with rose bushes. Well, they aren’t exactly bushes at all– more like sparse sticks with thorns and a few leaves. It’s not lovely or welcoming. But I envision the day when I drive up to find a prolific display of colors exploding with blooms extended from luxuriant flourishing bushes. My husband, Chad, does not share my vision. Instead, he has urged me to remove these stragglers. He thinks they’re an eyesore. Indeed, my ugly bushes are not a vision of horticultural beauty. But I haven’t been willing to cooperate. Their current state continues to remind me of my own spiritual place of discontent. Just as I long for thriving plants that burst with a kaleidoscope of colors, I deeply desire to live a life of substance that bears an exuberant amount of spiritual fruit. We do not have the patience to endure what the day brings. Those closest to us pay the consequences. Sometime our anger is not in check–losing control of our emotions. We battle forgiveness and resolution, mentally regurgitating events we have endured by hurtful people. We recite different endings– what we SHOULD have said instead of what we DID SAY—that may have made all the difference–at least to our pride. We fret and worry in the face of unknown circumstances and questions without answers–– not really sure if God recognizes the gravity of our circumstances. We wonder if He is willing to help us. Sometimes we’ve simply lost our vision for who God has designed us to be. Life is not what we planned, but numbness or even indifference develops toward others. God’s purpose for you is that you become a prolific bloomer–that you increase your bloom-ability! We find this truth in Scripture (John 15:8). You and I must simply make a choice: Either we will take Him at His Word and move to the next level– or we won’t. I’m going to choose to be a Take-Him-At-His-Word kind of girl. What about you? Will you join me as we look more closely as what Jesus has to say to use about increasing our bloom-ability? The next day in this series should post Thursday.